Since I discovered the W7 palettes my eye make up has really been given a new lease of life. 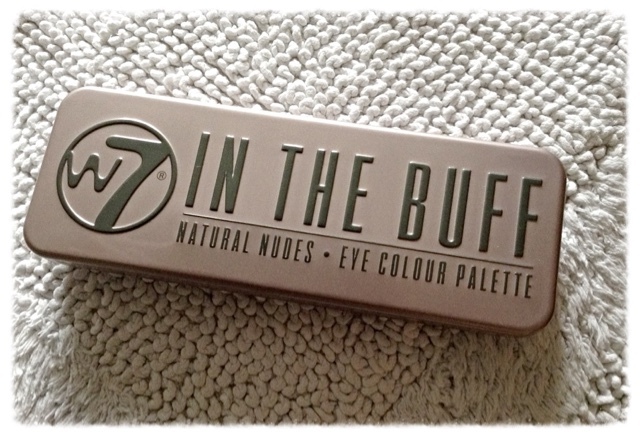 My favourite at the moment is a W7 eye shadow collection called "In the Buff" and there's a few reasons it's become my best friend. I bought it from Amazon a few months ago, I'd been searching for a good deal on a Naked Basics as mine was running out and I wanted to replace it. When I read the reviews for this almost everyone said how good it was, how long it lasted on your eyelids and how they thought it was as good as everyone's favourite Urban Decay palette. Given that there was a £30.00 price difference between the two I decided to try the W7 (incidentally it cost £6.00 - definitely worth a try). There is a selection of really good colours and you get a double ended applicator as well but I've managed to lose that which is why I popped in a Real Techniques brush for the photo. The colours are a mixture of matte and shimmery shades and a couple that can be used as highlighters or on their own for a more natural look. I found the shadows easy to apply, no fall out off the brush but be careful with the black as it's very pigmented, I use it as a liner and the first time I did it the line was all over the place, and I couldn't wipe it off easily, better to start off with a little bit and build up which is what I do now. The consistency is lovely and I haven't had any issues with the colours disappearing into my creases during the day, I do use a primer though as I find it gives a good base and tends to help all eye shadows to last longer. I thought priming my eyelids was a faff at first, just one more thing to put on but it's well worth it and it only takes a couple of seconds. 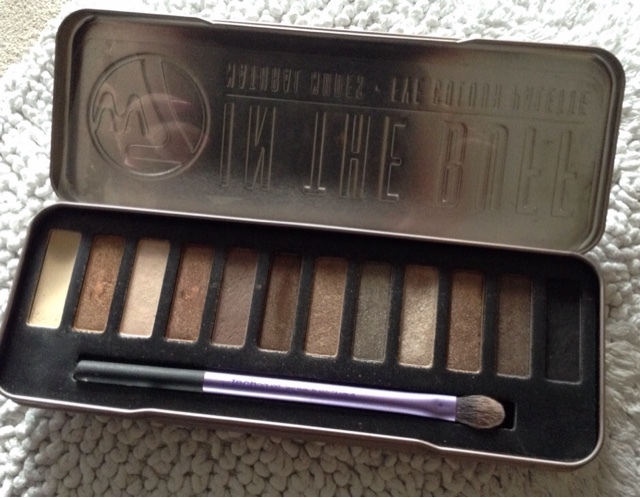 All in all this is a great palette for the price so bravo to W7 I say! It's just one of many eye shadow palettes they have on offer, Amazon keep recommending the others to me since I bought this one so I imagine another one will be added to my collection fairly soon, probably in January when I am broke after Christmas but am desperate to buy something nice for myself to get me out of the post festivities slump! I'm partial to a blusher or two and I keep seeing the pretty W7 blusher palettes everywhere and I've read a few blog reviews on them recently and they've all been positive. Maybe I'll get a blush instead? 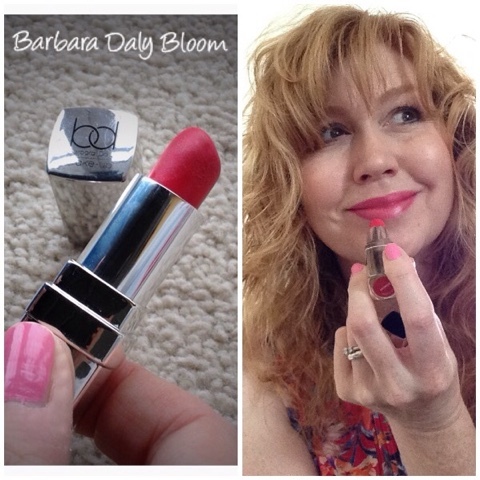 Time for another Lipstick Love ... or rather A Lipstick That I Love. This one is by the make up artist Barbara Daly and was purchased from the cosmetic range she created for Tescos. It's called Bloom and is a lovely fresh pink colour. I have to be careful with pink because not all pinks like me but this one is great because the colour veers towards a deeper pink rather than a pale one. I usually reel it out in the Spring and Summer months mostly because it goes with the lighter colours that I tend to wear but it does also look good with black, which is a bonus because there are weeks when I wear nothing but black (I'm a lazy dresser). This lipstick glides on and is not tacky or drying, moreover it is moisturising but not in a sticky balm kind of way and I love it because it fades rather than leaving a delightful outline round the lips. Having said that, I've just remembered that I did buy another one in this Barbara Daly range called Spice, nice neutral pale brown but it literally lasted five minutes on my lips and then was gone, which I was disappointed about because I really wanted to love it as much as Bloom. 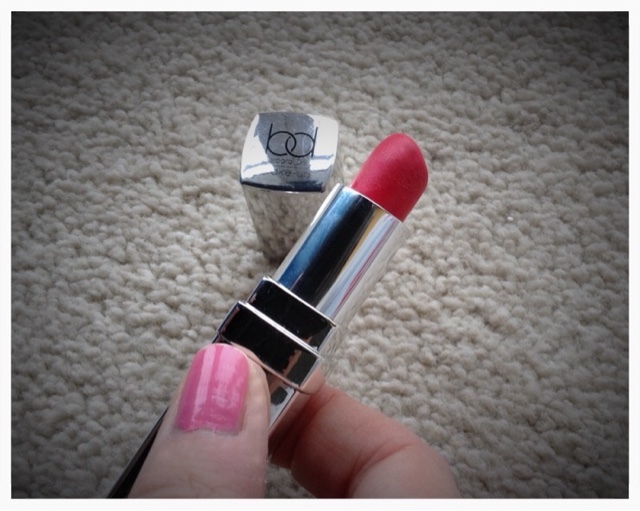 I don't know where it is now, probably at the bottom of a handbag like most of my other lipsticks! I've actually got two of these in the same colour because I lost one (scatty) so I bought a replacement, then found the original in a handbag I hardly ever use. It's actually good that I've got two because as far as I can see this range has been discontinued in favour of Barbara's newer range Bd Trade Secrets. If you go online www.tesco.com and search 'beauty' you can check out all the colours and of course, they are also sold the beauty section of the larger Tesco stores. There are a couple of colours that I think I might try and the price is good too at £5.99. While I'm sorry I won't be able to replace this one I do have two so it will take me a while to use them up and I definitely will try the Bd Trade Secrets ones. 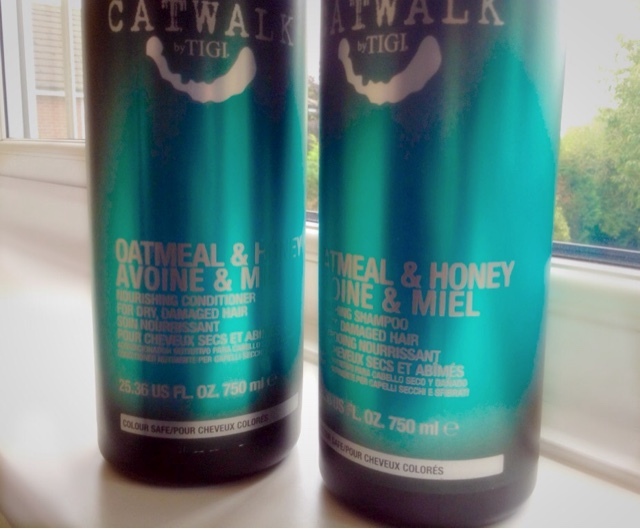 When I was at the Professional Beauty Show North in September I bought this amazing Oatmeal and Honey shampoo and conditioner from the Catwalk by Tigi range (see photo, the containers are massive, 750ml each). It was a total bargain, £20.00 for both of them and I can honestly say since using this product my hair has had a new lease of life. Leave In Conditioner v. Wash Out? For a very long time now I've been a fan of leave in conditioners, my faithful Aussie leave in conditioner is something I can't live without but recently my hair seemed to be really dry and I felt it needed a deeper daily conditioning treatment. I've shied away from them because frankly, my mornings are so chaotic that I just don't have time but I've made myself get up and in the shower a few minutes earlier so I can spend more time on my hair. I'm aware that now we're racing towards the Winter months it might need a bit more attention what with the weather and the central heating drying it out. 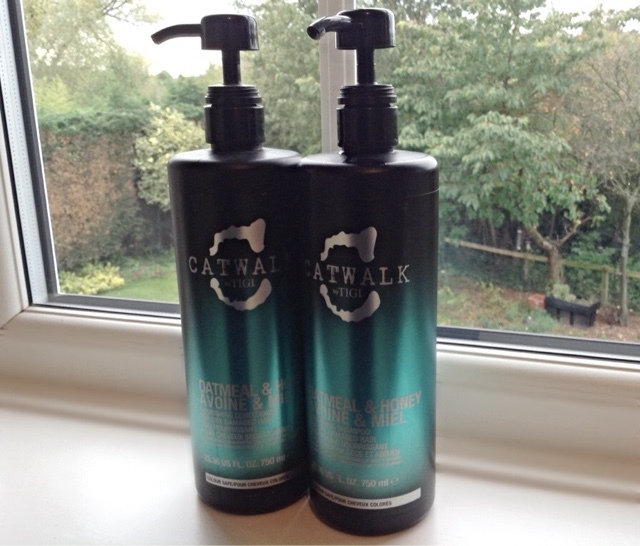 I think the Catwalk range is amazing, I've long been a fan of Curls Rock, their curl cream. There is a product for everyone covering all types of hair, the one I picked up is for dry hair. The scent of Oatmeal and Honey is truly gorgeous, you do actually want to eat it (don't) and the entire bathroom smells super yummy afterwards. The conditioner is really creamy and the pump function on the container means that I don't put too much on, mainly from midway down my hair to the ends and a brief wipe over my fringe. Once the conditioner is on, the fragrance is sealed in for the rest of the day and I was pleased that it doesn't take long to rinse out (my main gripe with conditioners is usually that I can never be sure all the conditioner is completely gone). Generally, my morning routine is that I get dressed and put my make up on whilst my hair is still in a towel so it is pretty much towel dried by the time I take it off to dry it off and style with the hairdryer. 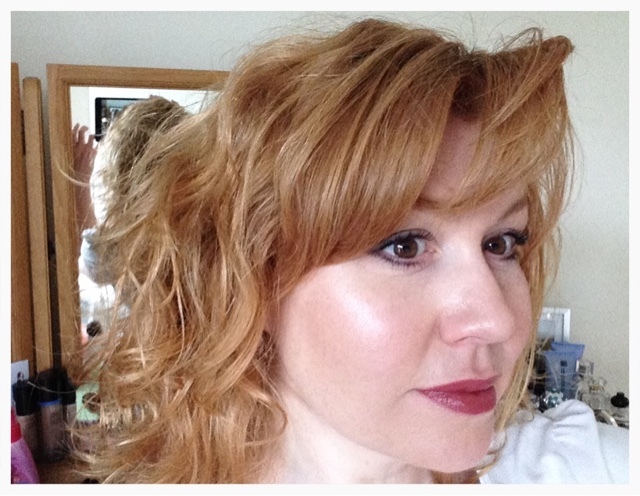 It was absolute bliss to get the comb through it first time, no tangles and no frizz thank you very much. I just run some Label M Curl Cream or Curls Rock near the ends and quickly blow it dry. The curl and the softness seems to last all day, and even when I get caught in the rain and goes a bit bonkers it doesn't frizz up so clearly the deep conditioning treatment my hair is getting is really helping. Want to buy some? Check out these links! Given that I won't be able to go back to the show until next year to purchase more I decided to find out where else I could purchase from, I found them online in case you're interested in trying it. All the sites below sell 300ml bottles as well. www.feelunique.com/catwalk - these were quite pricey, over £20 for each bottle. www.ebay.com - loads to choose from on ebay, take your pick! Lots of sellers at different prices. www.allbeauty.com - one of my favourite sites that always seems to have a fantastic sale on, they are selling both shampoo and conditioner in a set for £19.99. 750ml bottles - lasts a while! 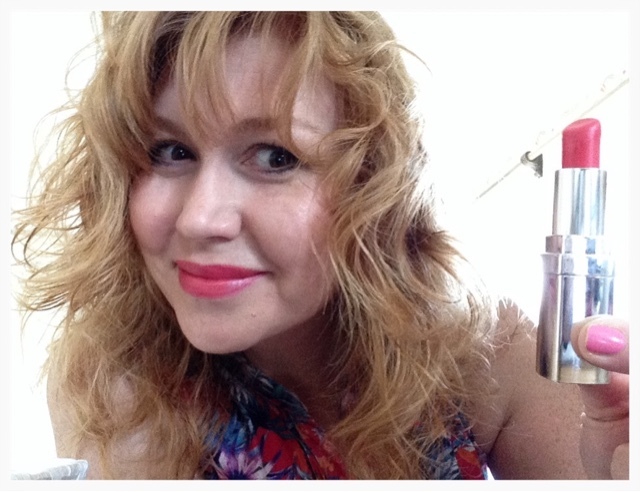 Today I thought I'd show you a lipstick that I got in the USA when I was on holiday earlier this year. I love scouring the shops there to find things that you can't get over here and this didn't disappoint. 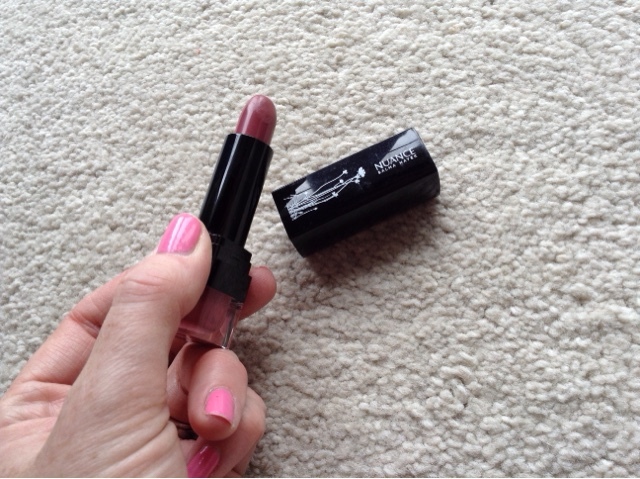 This lipstick is one of my favourites at the moment as it is a beautiful Autumnal brownish/pink colour that goes with the season and all my Autumn coloured clothes, it's called Dusky Rose. 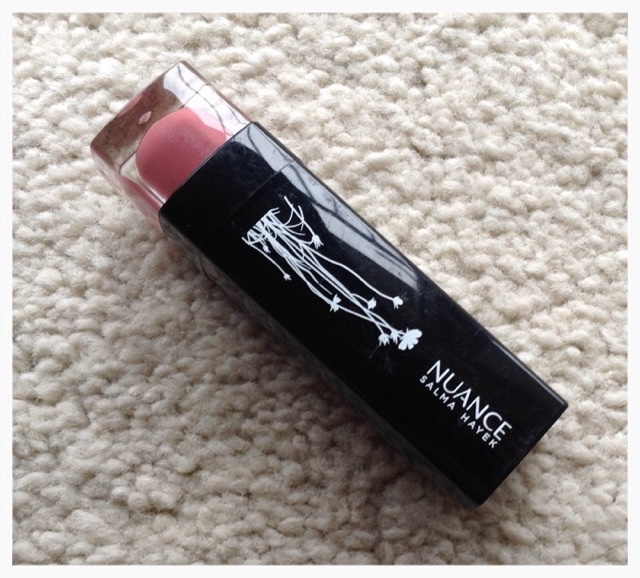 I hadn't heard of the Nuance brand before, sadly we don't have it here in the UK but this lipstick is by the actress Salma Hayek and having done a bit of research when I got home I can tell you that she has created a range of cosmetics exclusively for CVS Pharmacy. I only bought the lipstick but to be fair I could have quite happily tried her entire range, there's so much to choose from and skin care too. I love the packaging (I'm a self-confessed packaging magpie, ooh pretty, must have it, that's me). But seriously, for what I guess could be considered a budget range (I think the lipstick was under $10) I think it looks quite fancy and the lipstick itself has a nice feel to it and doesn't come off after the first five minutes which is a plus for me, if you've read any of my other lippy reviews you'll know that my bugbear is those lipsticks that disappear off your face after the first cup of tea and you're reapplying all day long - tiresome. I've recently gone back to using a lip brush (thank you Real Techniques) and you can get a really gorgeous finish with this lipstick (needs blotting though, on me anyway). I'm also of an age where those little lines are starting to appear round my mouth, maybe I scowl a lot (early forties - pah!) so I am conscious of wearing lipsticks that don't "bleed" into the lines and I am happy to say that this one is a delight to wear the lipstick stays on the lips and doesn't travel up or down your face. Thank you Salma. I'd be really interested to hear if anyone has tried anything else in the Salma Hayek range? I'll definitely be trying more of her cosmetics next time I'm in the US.